We’re having a LibraryThing meet up at the Library Bar in LA tonight! Come join us for a beer around 7 pm. It’s downtown, at 630 West 6th St (directions and a map here). Tim and I are off to Los Angeles in the morning (in the very very early morning) to go to BookExpo America (BEA)—the US’s biggest book fair. It’s always a fun event, full of authors and publishers and booksellers and librarians and other book-industry-types. The event is limited to people within the “book industry”, but that includes you, librarians, so come on down! Free advance copies of books, meeting publishers, conference sessions about programming events and new book titles—BEA is very librarian friendly. Online registration is closed, but you can still get in at the door. If you’re at a loss for things to do (how could you be?) Tim is giving a talk (“Social Cataloging and Social Networking Experimentation: Insights from LibraryThing”) from 4-5 on Thursday (May 29th). On LibraryThing, check out the BEA 2008 group and BookExpo America on LibraryThing Local. I started adding events to the listing on Local, but there are over 600 author autographing sessions so I gave up. While we’re there, we’re having an LA meet-up of LibraryThing members. So whether you’re in the area just for BEA, or you live there, it’s the perfect excuse to have a beer with us! 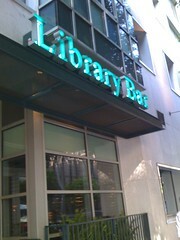 Come join us at the Library Bar (630 West 6th St.—directions here) on Friday night (May 30th) at 7pm. And everyone should check out the menu, even if you can’t come. The beer list is broken down into sections like “American Authors”, “Epic Novels”, “Women’s Studies”, and “Periodicals”. How can you resist?